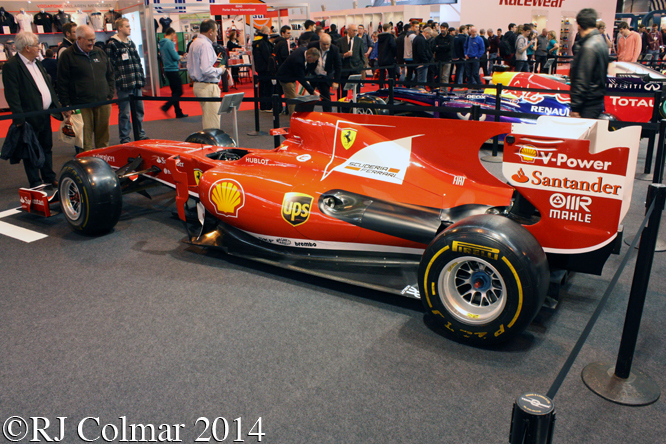 A couple of weeks ago the motor racing season kicked off with the Autosport International trade fair at Birmingham’s National Exhibition Centre (NEC) and I popped along to snacth a preview of the motor sporting year ahead. Today’s post show’s some of the Ferrari’s present. 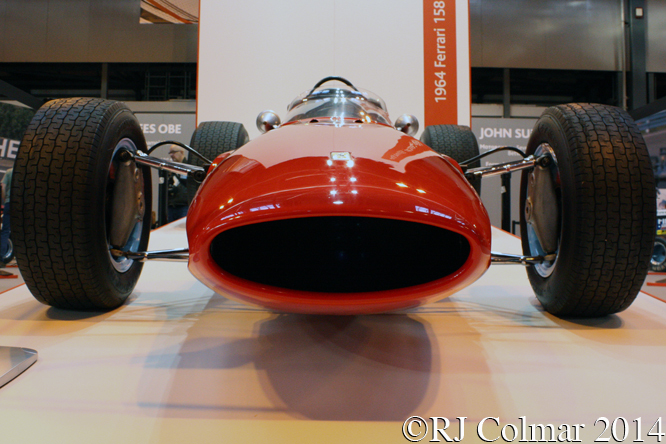 Undoubted star of the show was this Ferrari 158 as driven by John Surtees to the 1964 World Drivers Championship, unusually despite not winning the most races, an honour that fell to 1963 Champion Jim Clark who won 3 races to John’s 2, or the most points, an honour that fell to 1964 Champion Grahmam Hill who had to drop two points because only the best 6 from a maximum 10 results counted, leaving John to win the Championship by one point from Graham. John will be demonstarting the 158 which is owned by George Barber and usually found at the Barber Museum in Alabama. 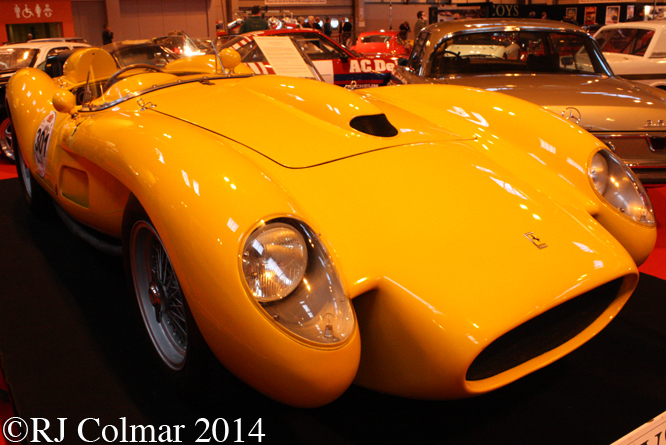 Oldest of the Ferrari’s that I noticed at the show was this 1956 Ferrari 250 GT Boano which in 1988 was fitted with a Scglietti pontoon style 250 TR Body by Giovannu Giordanengo in 1988 the car which was on the Coy’s Stand. This 2010 Ferrari F10 was looking a little dated among the contemporary Formula One cars on display, with it’s long outlawed outsize fin twixt air box and rear wing. 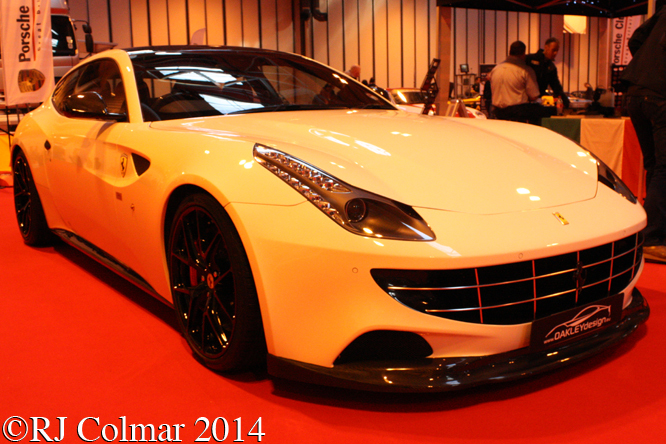 This Ferrari FF is fitted with subtle “Ultimate Performance Enhancing” goodies by Oakley Design. 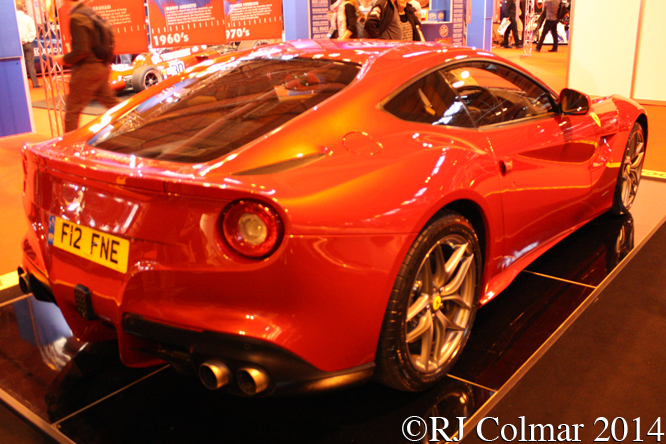 The Autocar stand featured a Ferrari F12, the first time I have seen one in the flesh. 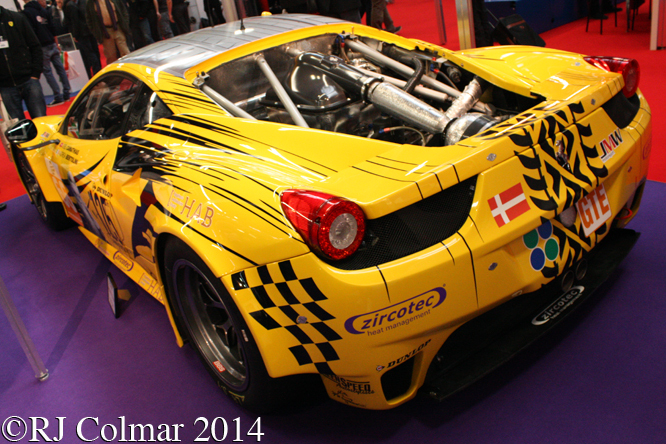 Looking a little like a work of art by Damien Hurst in one of his vitrene’s this Ferrari 458 Challenge GTC has been developed by FF Corse to make it suitable for competition in The Pirelli Ferrari Open and The GT Cup Championships in 2014. 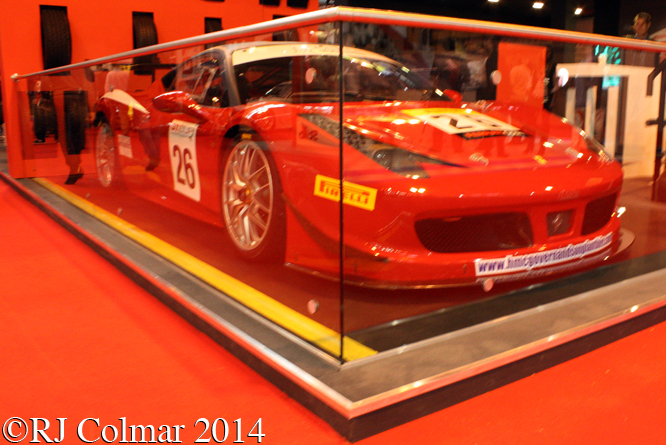 Last year Alex Martin won the GTC class and FF Corse the overall teams title in the GT Cup. While drivers with a bigger budget will be competing for a drive in the JMW Motorsports Ferrari 458 Italia GT2, which finished 34th in last years Le Mans 24 hours with Andrea Bertolini, Abdulaziz al Faisal and Khaled al Qubaisi at the wheel. This entry was posted in Uncategorized and tagged 158, 250GT/TR, 458 Challenge GTC, 458 Italia GT2, al Faisal, al Qubaisi, Autocar, Barber Museum, Bertolini, Birmingham, Coy's, F10, F12, Ferrari, FF, FF Corse, Giordanengo, GT Cup, JMW Motorsport, Martin, NEC, Oakley Design, Pirelli Ferrari Open, Surtees on January 31, 2014 by Ralph.